Faced with formidable obstacles after decades of decline, many Detroiters realized by the 1990s that bringing back their city would mean more than lifting up the auto industry. Their downtown was devastated, with more buildings standing empty than being used. Detroit’s future depended on reviving its central core. Soon, things began happening in Downtown Detroit that would set it on a surprising journey. Civic leaders formed a group known as “Detroit 300 Inc.” to prepare for the city’s 300th anniversary in 2001. This, in turn, sparked interest in creating a new park in the very center of downtown, an area referred to as Campus Martius. 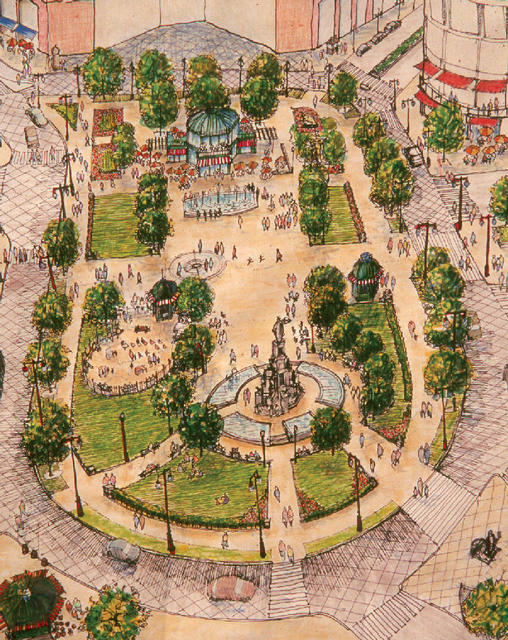 The group decided to develop a park as a legacy project and subsequently raised $20 million toward its construction. Mayor Dennis Archer, who envisioned the project as a gathering place for the city, wanted it to be “the best park in the world”. It was to attract people at all times of day, offering activities for those of all ages and social backgrounds. Campus Martius became a key factor in the decision of Compuware, a software company, to move its 3,500 employees downtown from a suburban office park into a new $400 million-dollar building on the park—a reversal of longstanding patterns of businesses fleeing the city. This set off a chain of other events: In 2010, Quicken Loans moved its headquarters to Campus Martius and began a major effort to renovate several buildings near the park—kicking off more than $1.5 billion in investment by founder Dan Gilbert. 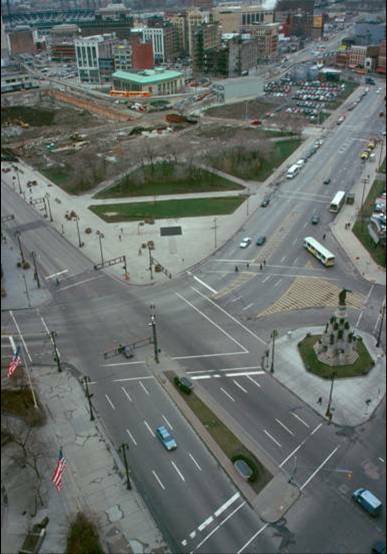 When Campus Martius Park opened in November, 2004, people started coming back downtown for concerts, outdoor movies, the ever-changing flower gardens, dates at the park cafe, or simply to sit and relax by the fountain. In another unexpected turn of events, Southwest Airlines, as a pilot for their “Heart of the Community” program, helped to develop an urban beach as a seasonal attraction at one end of the park The beach sports real sand, umbrellas, a variety of games, a beach café (in addition to Campus Martius’s year-round café), a sun deck, and more. More than 500 events, ranging from the Detroit International Jazz Festival to movies and live theatre shows for kids, are held throughout the warmer months. The park’s popularity extends throughout the year. The ice rink is open—and crowded—125 days a year. A large holiday tree is lit in a festive public ceremony. The park’s chairs, which can be moved so people are able to find a nice place to sit in the sun or away from the wind, are kept out all year. 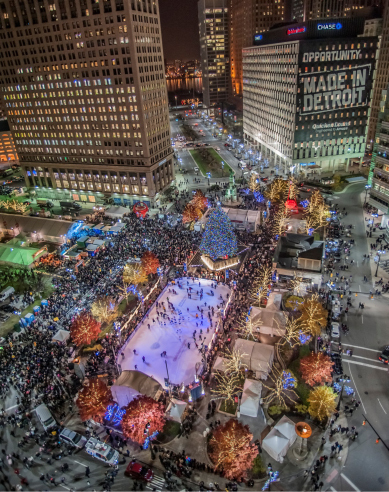 Campus Martius is the Detroit area’s signature downtown public space, as Rockefeller center is to New York City. The park is has indeed delivered on its promise to be Detroit’s “gathering place” and is now recognized internationally. New development, restored historic skyscrapers surrounding the park, street level cafés and food trucks to the Quicken Loans Headquarters now frame what has become a vibrant city center. It attracts people day and night, providing activities for different ages and types of people year round. The park celebrates and embraces diversity every day. The new Q-Line streetcar (also known as M-1) now glides past Campus Martius on its path from downtown to the burgeoning Midtown and New Center neighborhoods. The line is envisioned to be one element of a modern, world-class regional transit system, in which all forms of transportation are prioritized, in order to build a vibrant, walkable region; including rail, bus, cars, cyclists, and pedestrians. In a groundbreaking public-private partnership, the project will be the first of its type to be led and funded by both private businesses and philanthropic organizations, in collaboration with local government, the State of Michigan, and the U.S. Department of Transportation. 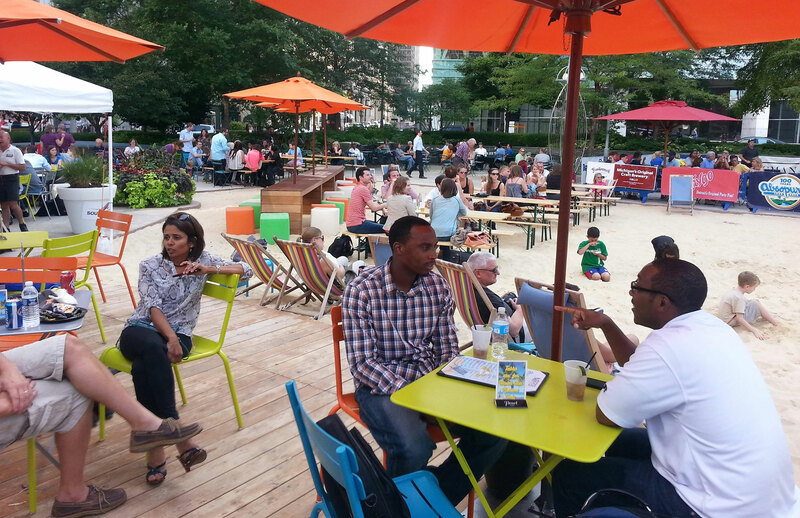 A new public space—the Esplanade on Woodward Avenue—has been created next door to Campus Martius, featuring green space, gardens, walkways, artistic seating, swings, 12-foot arches, live entertainment, and food trucks.